Your application of the theory overlooks a critical fact. In fact, stopping the back lens reduces the NA also, by blocking rays that go through the periphery of the front lens from getting through to the sensor. For resolution, it makes no difference whether the rays get blocked sooner or later; the only issue is that they do get blocked. At image center, there is theoretically no difference between stopping the front lens and stopping the back lens, assuming that you end up at the same NA and effective f-number. The same rays get selected either way. In practice, there may be a little more veiling glare one way or the other due to stray reflections. Away from image center there are differences that can be very important, as discussed above. This is because changing the stop position changes which parts of the glass are used. Certainly the colored banding would go away. But I suspect that a good deal of the blur is due to other aberrations such as coma that would remain. How about stopping down BOTH front and back lens? Wouldnt aberrations compensate themselves? It would also save a hassle of putting iris between every combo, wouldnt it? Maybe that would give you the worst of both worlds....putting an aperture in the middle is actually easy and if properly placed, makes the combo telecentric. Win-win!!! That's very interesting. As much as i love telecentric lenses, and despite reading quite a bit about them, i have problems in understanding it. Is every lens combo telecentric? Or it's becoming telecentric when you stop it down between lenses to certain value? Is infinity microscope telecentric? The way i see it, it looks like it's telecentric on sensor side, but not on subject side. Does this make sense? Rik has written a lot about telecentric lenses on this forum, and that's where I learned about it. I've also written several posts about it. Look up "telecentric" in the forum and you can get up to speed too. Short answer: you need to make the aperture appear to be infinitely far away when looking at it from in front of the lens. You can achieve this in several ways. For example, you can do it by using the lens's diaphragm and adding a suitable close-up lens, adjusting the spacing between the close-up lens and the main lens it so that the main lens' aperture appears to be infinitely far away. But for a given lens, this will only work for a small range of close-up lens strengths, and the required spacing may vary with lens focus. Alternatively, you can put a paper aperture between two coupled lenses and adjust its position until it looks like it is at infinity. The aperture has to be small enough that it is the limiting aperture in the system. As long as that is true, then you can change the rear lens (or zoom it) to change magnifications without affecting the telecentricity of the system. You can check the position of the aperture by looking at it through the front of the lens combo with a camera or telescope or binoculars pre-focused at infinity. When the aperture is in the right place, it will be sharp when seen through the camera/binoculars/telescope focused at infinity. How about stopping down BOTH front and back lens? Having two limiting apertures is generally a bad idea because it leads to vignetting. With infinity objective on telephoto as tube lens, which is really just another form of combo, some people report slightly higher image quality by stopping the telephoto a little bit. It's unclear whether that has something to do with aberrations, or if the telephoto aperture really acts like a baffle to reduce veiling glare without limiting any of the imaging rays. The answer to the first question is "no". To the second question it is "yes", assuming that the aperture is properly placed as nicely summarized above by Lou Jost. Is infinity microscope telecentric? The way i see it, it looks like it's telecentric on sensor side, but not on subject side. An infinity objective by itself is certainly not telecentric on the image side. If it were, then all the chief rays -- the central ray in the bundle of rays for each feature of the subject -- would all have to be parallel to the optical axis. But then the objective would be useless, because all the outgoing rays would be parallel for all points in the field, and there would be no way to separate rays belonging to one bundle from rays belonging to all the other bundles which would overlap it. 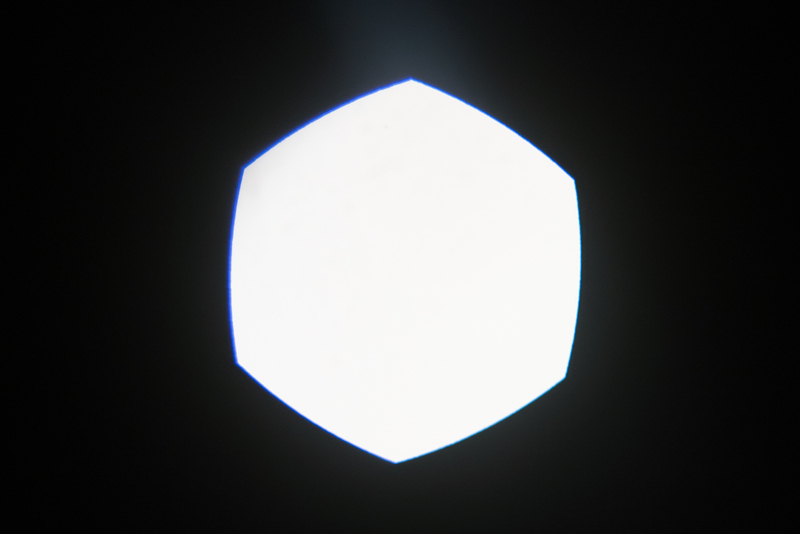 An infinity objective in combination with its tube lens can be telecentric on the image side. 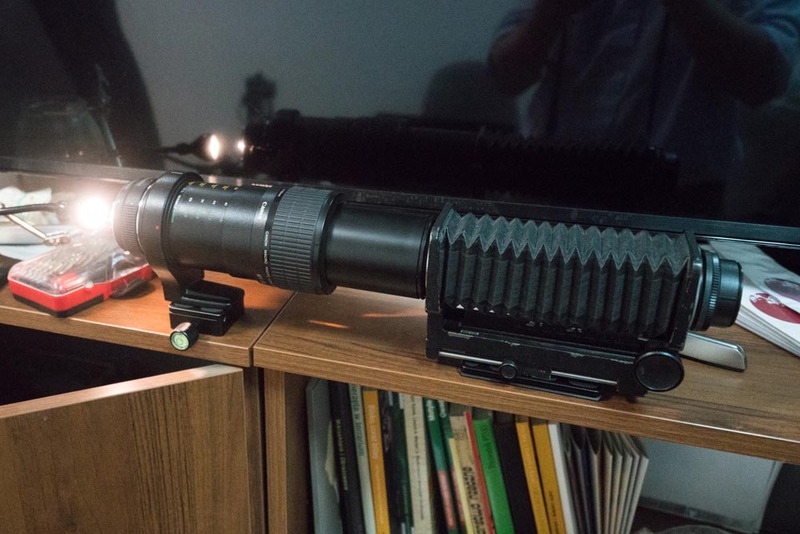 What that requires is to place the objective far in front of the tube lens, so that the limiting aperture in the objective appears to be at infinity when viewed through the tube lens. For applications commonly seen at photomacrography.net, telecentric on the image side would not be a great idea for at least two reasons. First, in any system that is telecentric on the image side, the rear element of the lens must be at least as large as the sensor diagonal plus the diameter of the exit cone where it leaves the lens. Even for APS-C and modest NA objectives, that means at least 38 mm, which is slightly larger than Raynox DCR-150 and much larger than any of the standard tube lenses from Mitutoyo, Nikon, or Thorlabs. As a result, this approach works only on small sensors. Second, when the system is telecentric on the image side, it becomes impossible to tweak the magnification just by changing the distance between tube lens and sensor. However, telecentric on the image side is an excellent idea for many industrial applications. In that case, the limitation to small sensors is not a problem, and the resistance to magnification changes is a distinct advantage because it allows changing focus without recalibrating for any measurements. In fact when a lens is telecentric on both sides, then the magnification is "baked into" the optical design and will not be changed no matter how you adjust focus. It's a great simplification for inspection tasks. On the subject side, any objective can be telecentric or not, depending on where the manufacturer happened to place the limiting aperture with respect to the lens elements in front of it. Many objectives, particularly at higher magnification, are not strictly speaking telecentric, but they are close enough to be treated as if they were because their shallow DOF leads to insignificant scale change within the in-focus slab. Thank you both for the info. I think i've read everything about telecentric lenses i could found on this forum, yet i still lack of understanding / first hand experience as i currently lack hardware to "read and confirm". Alternatively, you can put a paper aperture between two coupled lenses and adjust its position until it looks like it is at infinity. The aperture has to be small enough that it is the limiting aperture in the system. So lets try this with example im considering. Lets say i have 1:1 macro lens on 4,5 um pixel. Stopping it down to F4 gives me optimal image at EF=8 that lacks telecentricity. 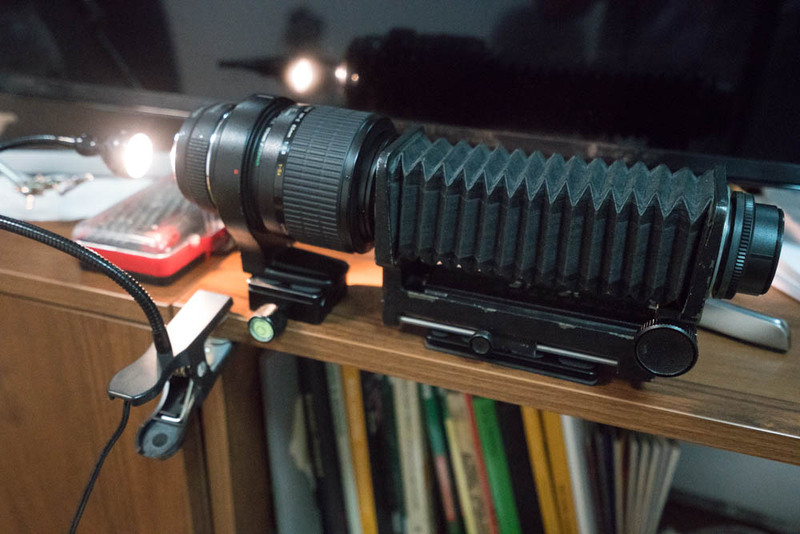 Instead of it, im gonna use 150mm F5,6 enlarger, reversed on another identical 150mm F5,6 enlarger. Since it's lens combo, at 1:1 F=EF. So to keep my system off diffraction teritory, i could stop the combo to F8 with aperture inserted between those lenses. Since it's stopped down by 1 stop, it's gonna be both telecentric and diffraction limited. Win-win? Now another silly question: how much stopping down really needs to be done? It has to be limiting aperture of the system F5,6 in this example, so lets say that i stop it to F5,7... it's telecentric already? some people report slightly higher image quality by stopping the telephoto a little bit. It's unclear whether that has something to do with aberrations, or if the telephoto aperture really acts like a baffle to reduce veiling glare without limiting any of the imaging rays. That's exactly what im observing with infinity microscope objectives on tube lenses. It's the main reason i prefere repro lenses instead of raynoxes. By stopping down i can nicely cut shiny microscope screw, it appears that it have no other impact on final image. We can't say in advance how much to stop it down. Every lens combo is different; like any lens, you have to stop it down until you find the sweet spot between controlling lens aberrations and avoiding diffraction. You also have to make sure that your aperture is the one that is limiting the light, as you noted. Why i think of enlarger is because my componon 150mm (old shiny version) is appearing to work well at infinity, and is sharp from corner to corner, like it's in center. Cant say that about many lenses i owned. Also those are only lenses that come in mind without being "coverslip" corrected. I mean sensor filter stack. Other m42 / analog lenses seems to mushy in corners. Thanks for the link, i'll read it and get back to it. im gonna use 150mm F5,6 enlarger, reversed on another identical 150mm F5,6 enlarger. Since it's lens combo, at 1:1 F=EF. You will run into a couple of difficulties with this. First, remember that the front lens element must be as wide as the subject field diameter plus the entrance cone diameter where it enters the lens. 150mm/5.6 = 26.8 mm, already smaller than the diagonal of a frame on APS-C at 1:1. If you then want to run at f/8, the entrance cone diameter will be about 150mm/8 = 18.75 mm. The difference between those, only about 8 mm, will be the diameter of the telecentric field. Stopping down will make that field larger. Second, and closely related to the above, you are likely to have some issues with vignetting because of a small aperture positioned so far behind the rather small front lens. A mild version of this is visible in the first image of Lou's test at http://www.photomacrography.net/forum/viewtopic.php?t=33553 . In any case, rather than adding an aperture between the two lenses, I suggest just positioning the two lenses so that the click-stop aperture of the rear lens is placed the correct distance behind the front lens. See http://www.photomacrography.net/forum/viewtopic.php?t=1032 for a setup that uses this approach. Achieving telecentricity at 1:1 over a reasonably large sensor is not simple. The best success that I've had is with Raynox DCR-250 in front of a macro lens, as documented at http://www.photomacrography.net/forum/viewtopic.php?p=117615#117615 . That works over APS-C. It helps a lot that the Raynox has a large glass diameter (about 35mm). Regarding aberrations, note that there is some tension between minimal aberrations and telecentricity. A lens that is telecentric on the object side will necessarily be using peripheral portions of its glass. A good way to think of it is to imagine the subject field stamped onto the front of the lens, then expanded on all sides by half the diameter of the entrance code. In contrast, to minimize aberrations you would put the two lenses as close together as possible, then position the aperture so as to get the best compromise. Waiting for one adapter to test it properly while imaging. 100mm macro lens failed to keep aperture sharp during focusing. I guess it's because Mp-E65 seems to keep entrance pupil at constant. but i wonder how it will affect magnification and effective aperture of this system? Due to Raynox having ~36mm entrance pupil, so it should not vignette from 1,2x up while being telecentric. Am i getting it right? Sorry, but this won't work. The problem is that the MP-E 65 on camera requires that the subject be placed closer than that added Raynox. So you won't be able to focus a subject that is placed in a zone where the optics are telecentric. To make a telecentric combo, the added lens has to be short enough to be placed in front of the subject and still focus the aperture at infinity. It is possible to add a lens to the MP-E 65 to make a telecentric combo, but the added achromat must be pretty short, more like 50 mm focal length. See the discussion at http://www.photomacrography.net/forum/viewtopic.php?p=69559#69559 .